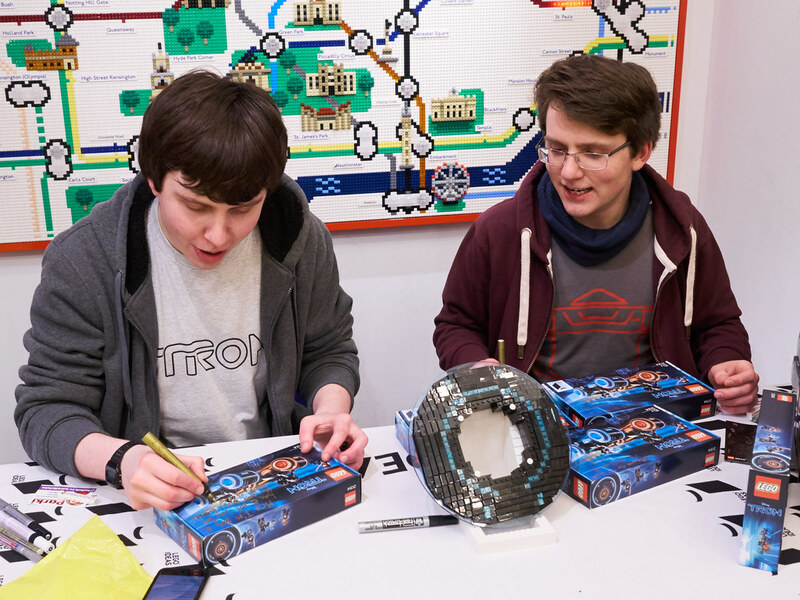 21314 TRON: Legacy had an early release at the flagship London Leicester Square yesterday, and for those happy to take their chances with the weather and the queues, there was an opportunity to get their sets signed by fan designers Tom and Drew, aka BrickBros UK. Timed on a Thursday before Bank Holiday Weekend, I was curious to see how things would work out numbers wise. 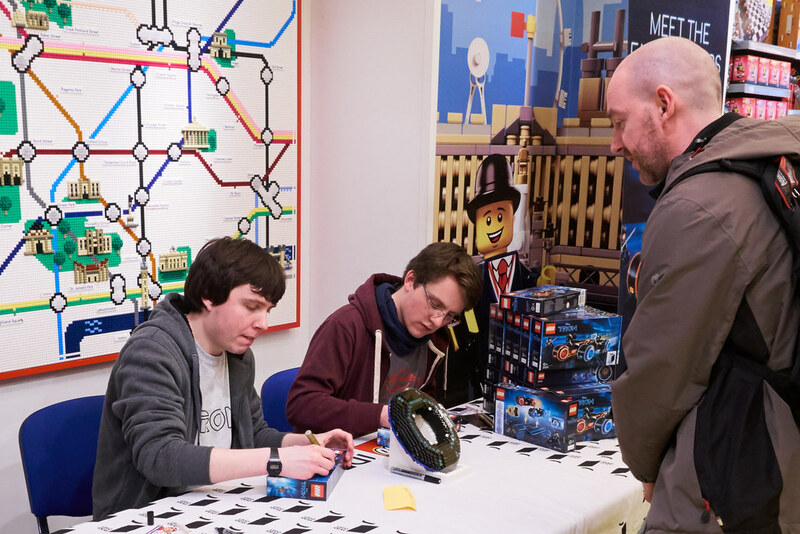 I've been to quite a few signings before – but all at Bluewater, and the weekday events there have meant that everyone who turned up managed to get their sets signed without struggle and had plenty of time after to talk to the designers. Naturally I felt compelled to steam up to London to find out how it would compare. With all the fuss of the 75192 Millennium Falcon launch it was going to be a hard act to follow. 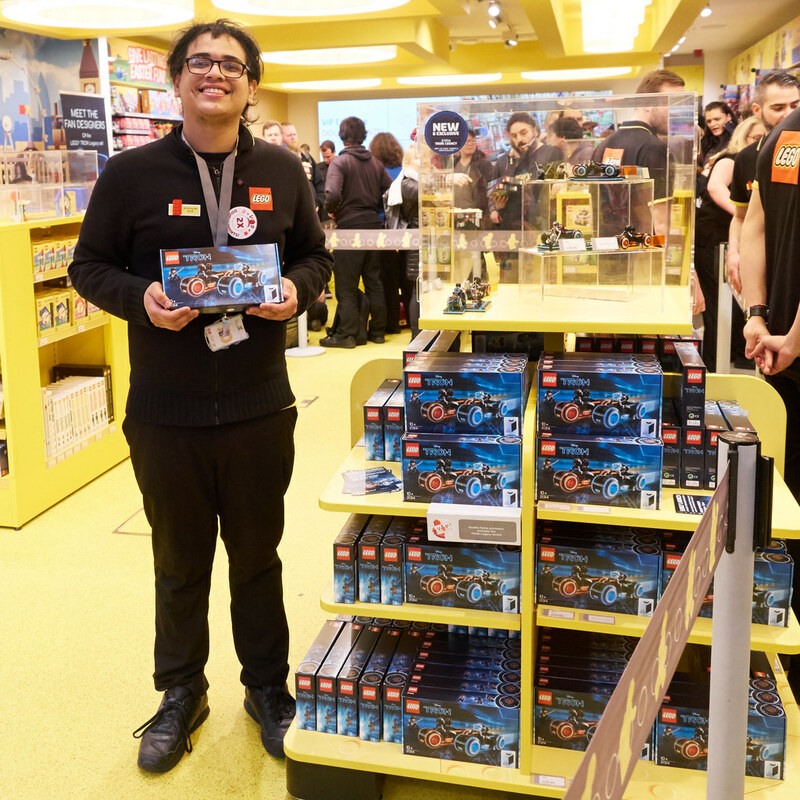 In terms of size the set couldn't be more opposite, but when I checked LEGO's Facebook page over 250 people said they were attending (pinch of salt on standby). Throw in the usual AFOLs, some tourists and kids who follow the BrickBros UK Youtube channel and I thought it would be wise to get there early. I arrived around 2.30 and the set was available immediately on the first stand inside the door. It was limited to 2 per person as mentioned on the Facebook page, so I grabbed mine, paid for them and had a snoop around. This is where having a two storey shop would be very handy, as the ground floor would soon be dedicated to the event. The signing table was ready to go with a whole bunch of sets stacked on it, and the crowd-tapes were in place to funnel the queue. I asked if Tom and Drew were there yet as I'd hoped to get a quick interview with them before the event started but they hadn't arrived at that time. As there was nobody in the signing queue I nipped upstairs to fill my Christmas PAB boxes for a while. When I came down, the signing queue had started to form and I joined it at around 3.15 – a good move as it soon lengthened quickly after that. 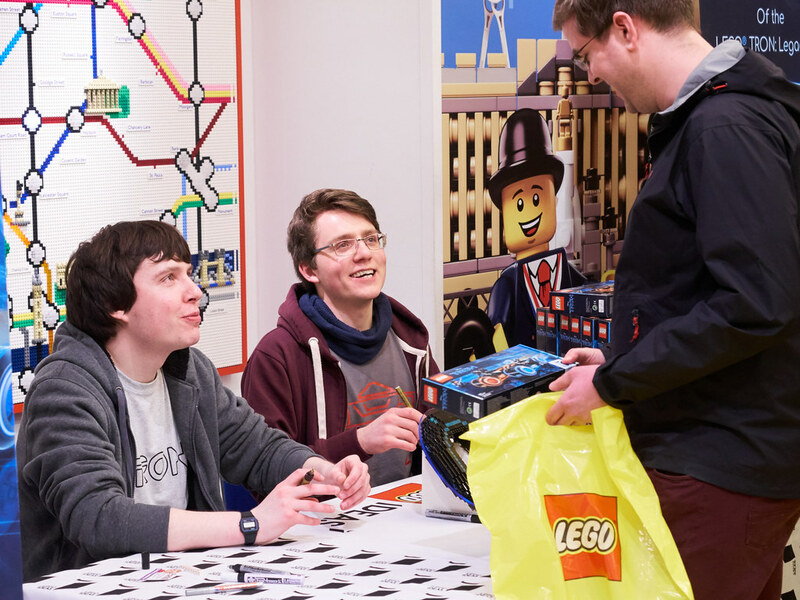 I got chatting to other people in the queue – local from London and some from abroad who I recognised from the LEGO House AFOL preview. Everyone seemed in good spirits. That is, unless you were one of the later contingency who had to queue outside. Typical British bank Holiday weather had crept in and it was a bit wet and cold out there which was a real shame. 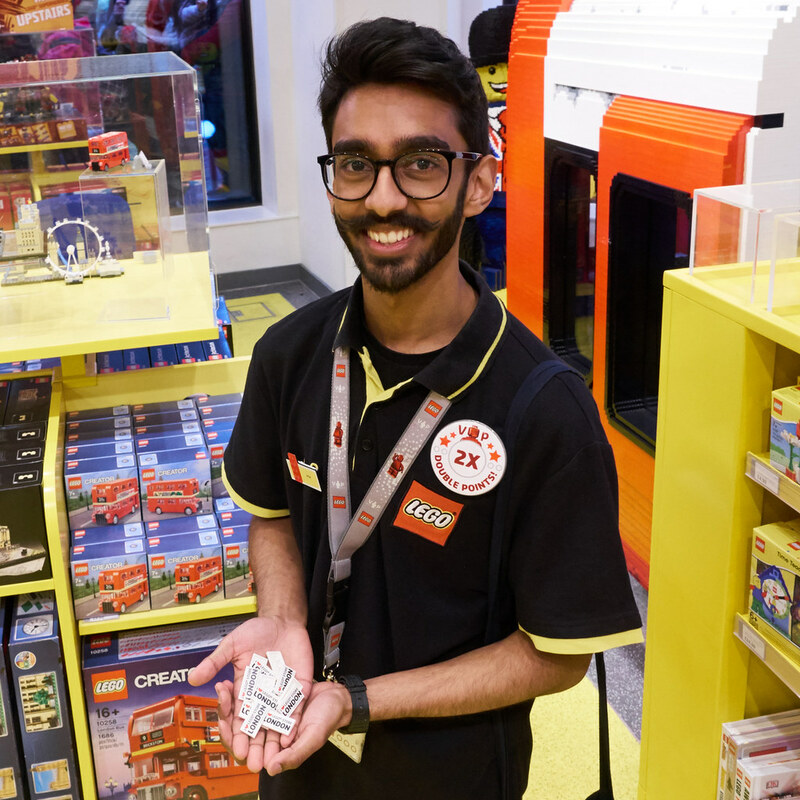 LEGO staff were, of course, excellent as usual and happy to pose for a pic or two so I killed time doing that while waiting for the event to start rolling. At 4pm Tom and Drew came out to kick things off. The queue moved slowly but at least it was moving. About half an hour later it became apparent though that there were too many people to manage by 7 o'clock and an announcement was made that it would be boxes only to be signed, and not posters or postcards in an attempt to speed things up. However around 5.20 (I think) the queue was closed to newcomers and people were turned away. I must admit, I didn't think this signing would be as popular as it was. TRON or TRON: Legacy are not the biggest blockbusters of all time but I think the combination of 80s retro appeal to the older generation, fans of the recent film and of the BrickBros themselves all added up. The buzz from the Falcon event must have had a little influence on it as well. 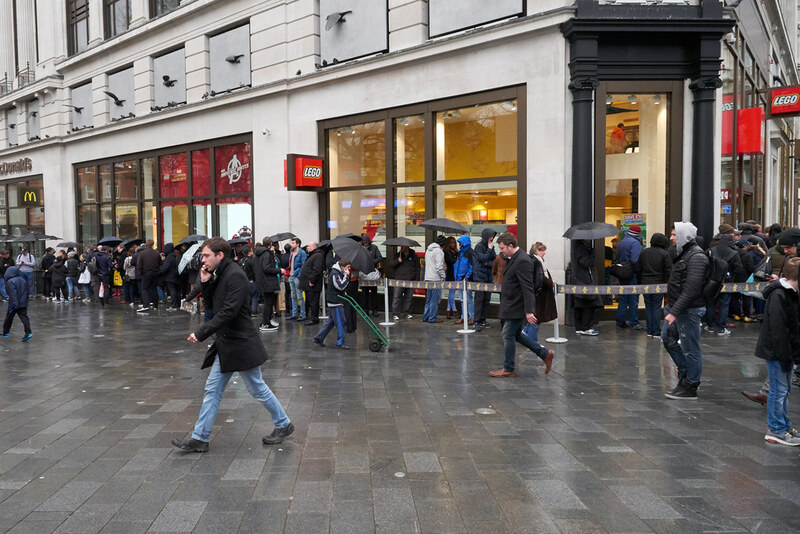 General public customers who wanted to shop as normal were sent upstairs and the ground floor was covered by a snaking line of people waiting for the signing. Every now and then the next wave of people would be allowed through to buy theirs at the downstairs tills and join the back of the inside queue. It was pretty well organised, but if I had been one of the unlucky ones standing outside I would would probably been a bit frustrated and grumpy at the speed of things. However, viewing things from the inside, it could only go as fast as it did. The staff were doing everything they could to make it work for the best. After I'd had mine signed I stayed around for a while to take pics and chat with others as I knew some Bricksetters would be coming through soon enough. 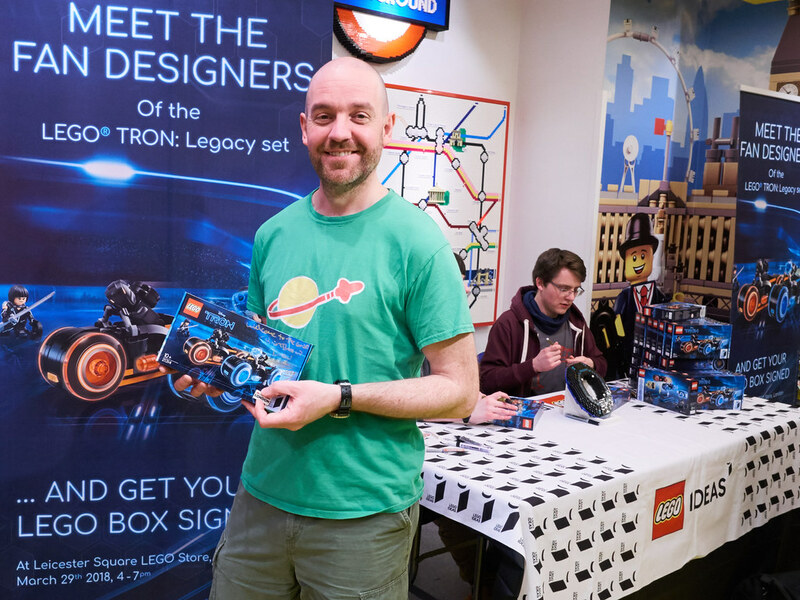 ... because this dude was giving away a TRON poster and an "I Love LEGO Store London" printed tile to all attendees. A nice freebie bonus, and he had a fab moustache as well. 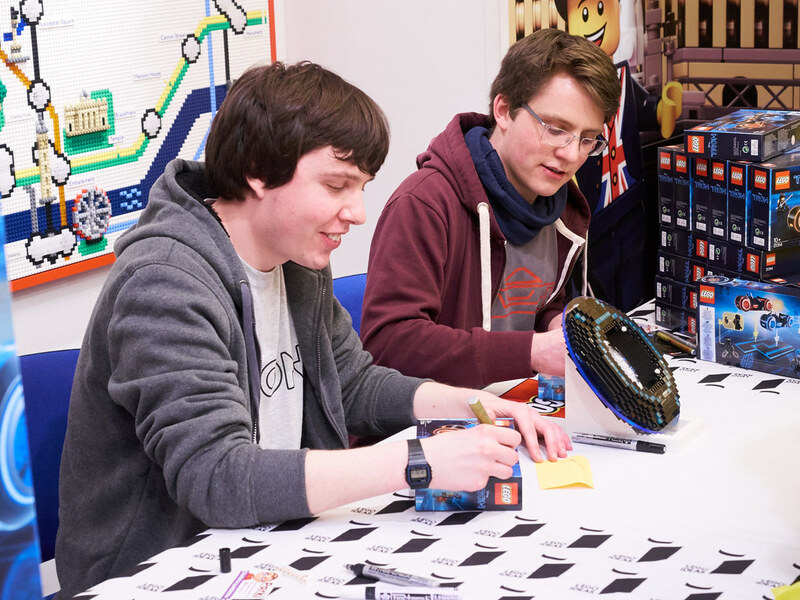 I'd earlier asked the team about staying on to get some other paraphernalia signed after the event but was told Tom and Drew needed to be away at 7pm on the dot as they had a long way to travel – which is fair enough. When it became increasingly obvious that everyone was not going to get their copies signed though, the boys agreed to change their plans and stay on for as long as they were able to which was really good of them. 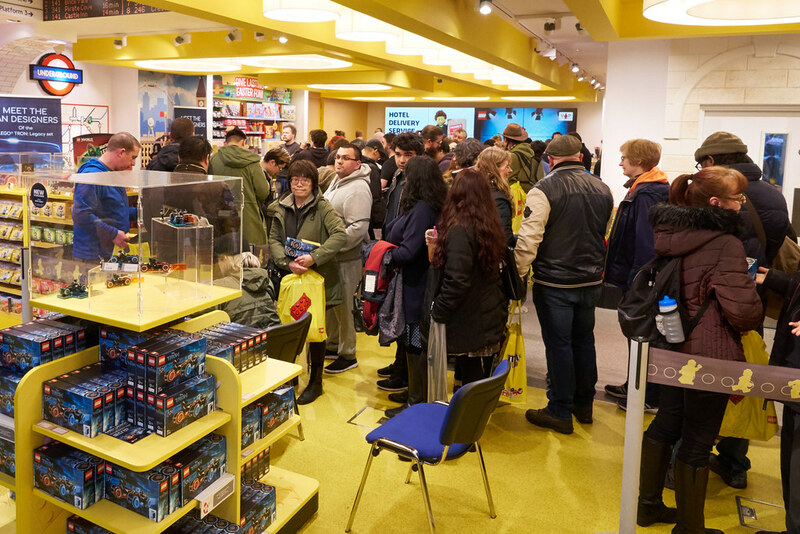 I'm not sure if every customer managed to to get theirs signed and I'd be keen to know from anyone who was there until the end if they did as I had to leave at 6:30. There was still a fair sized queue outside when I left. So in general, if you were early, warm and dry, it was a good event. If you were stuck outside, cold and wet, then I really hope you managed to get what you came for. Very nice account of the event! I wish I could have gone to it. TRON: LEGACY is one of my favorite movies of all time, and would have been great to meet the BrickBros. Unfortunately, being on the other side of the pond, there was no way I could have made it :) Glad to hear everyone had a relatively good time and that many happy customers got to have a very special item in their possession! Nice review of the event. 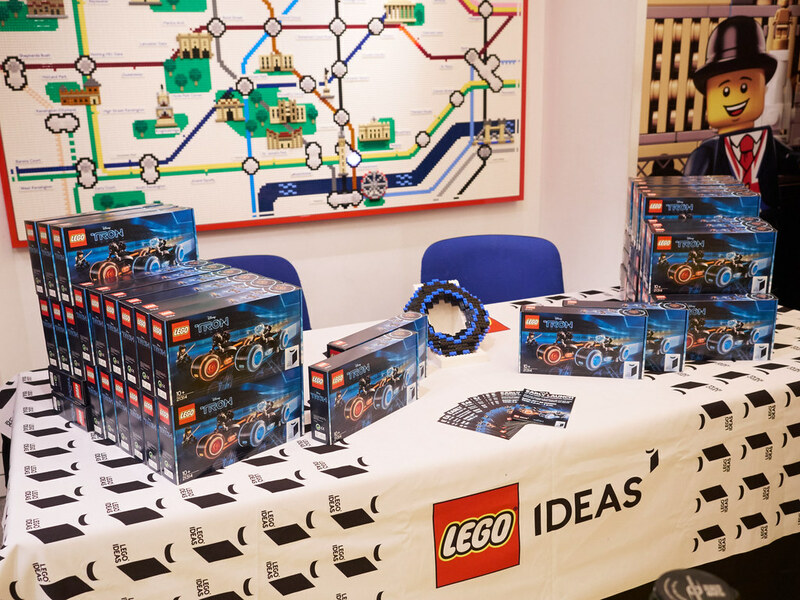 Due to being so far away from any LEGO store, getting to these events is nigh on impossible so it's nice to hear an in-depth report on what went on. Were both Tom and Drew signing everyone's items? Seems poorly planned time-wise if so - takes twice as long to have each of them sign one item. Might of been a better idea to have two lines queued and two tables for each of them to sign at. Eh... logistics. ^You may think it took a lot of extra time but as the majority of people bought two, they were being signed simultaneously. The queue was 'Officially' closed at 16:35 (ish), I know that because it was 2 mins after I'd got there from work and I was the last person in the queue! Although later, more 'die-hard' AFOLS queued up behind me anyway, all told that there was little chance they'd get their boxes signed before Tom & Drew had to leave. Fortunately for me and the 40ish people behind me, the boys had been convinced to stay a bit longer... Posters had run out, but meeting Tom & Drew was what it was all about. Cool! I've never attended anything like this, very interesting to hear the report of how it went, thanks for that! A great write-up & nice photos of the event! Well done, @iso3200; makes readers feel like they were there.